In December of last year we published an intriguing article by Dmitry Kalinichenko, “Grandmaster Putin’s Trap,” which has drawn far more attention from readers than we ever expected. It continues to be cited by many international political and economic experts. That article addressed Russia’s latent strategy to get rid of US bonds and use its petrodollars to buy monetary gold. It seemed for a while that the ruble’s nosedive late last year, coupled with the Kremlin’s reduced fiscal space, has left Moscow unable to pursue its plan to permanently diversify the international financial system. Nevertheless, taking a look at 2015, it turned out that Putin’s strategy is working quite well. 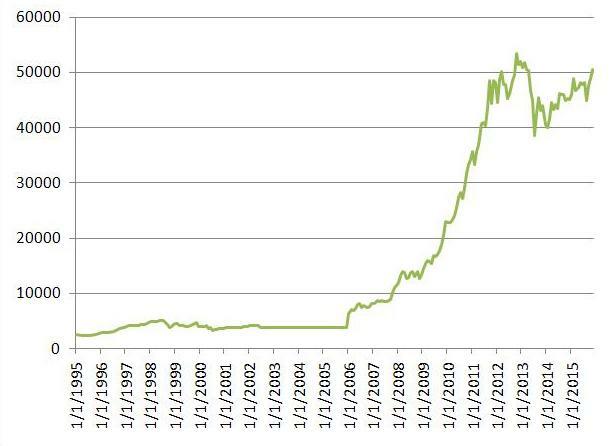 Due to invisible market’s hand the gold-to-oil price ratio has more than doubled in the past two years. While in May 2014 it cost 12 barrels of oil to buy one ounce of gold, this ratio rose to 26 barrels/ounce in January 2015 (where it currently remains). By lowering the price of oil relative to gold, it looks like Wall Street and London’s City are trying to hamper Russian tactic of buying gold in exchange for oil and natural gas (gas prices are linked to oil via BTU). However, these actions fell short of their goals. Declining oil prices and a depreciating national currency have not led to a slowdown in the Bank of Russia’s gold purchases on the domestic market for rubles. Despite threats and sanctions, Russia has continued to add to its gold reserves. Bank of Russia bought a record 171 tons of gold in 2014 and another 120 tons in the first ten months of 2015. Consequently, by November 1, 2015 the Bank of Russia had accumulated a total of 1,200 tons of gold in its reserves, which are officially the fifth largest in the world, although in reality Russia is actually in 4th place, as Germany is allowed to store only one-third of its reserves at home. In fairness, it should be noted that China has not provided updated data on its gold reserves since 2009, when it officially possessed 1,054 tons. According to some estimates, Chinese reserves may have tripled since than. The year 2014 brought Wall Street yet another unpleasant surprise. Russia emerged as the world’s second biggest gold producer, surpassed only by China. China and Russia’s global leadership in gold mining enables them to create their own currency and trading systems, built on a solid foundation of gold, which will be used by the BRICS countries as a universal unit of account and as a fixed measure of cost. Faced with the prospect of having to grapple with a powerful Russian-Chinese gold alliance soon that will call into question the dollar’s future as global reserve currency, the United States has begun to employ all its traditional punitive measures against a country that has dared to challenge America’s financial clout in the world. Ignore all the blather about “democratic values” – these measures are nothing but a way to force Russia to sell gold. The Russian people have heard Washington’s ultimatum and understand it perfectly: the US has imposed sanctions in order to oust the legitimate and democratically elected government in Moscow. But not surprisingly, the sanctions levied by the US against the Russian public – at great cost to the EU – have had the opposite effect. Russians have rallied around their nation’s leader, and China and Russia are now closer than ever before. The foreign policy of dictatorship of unmitigated arrogance, so fecklessly conducted by Washington, has had the expected consequences. By habitually and universally replacing the force of law with the right of force, the US has bungled away all of the political capital and credibility it had previously earned among the Russian and Chinese public. It is China’s support of Russia’s position that is neutralizing all of Washington’s attempts to lean on Moscow. 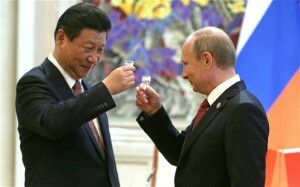 Even if Russia is forced to sell gold, it will sell it … to China, meaning that it will remain within the “gold alliance.” It is noteworthy that President Xi Jinping’s September visit to the US has not led to any substantial agreements. China is well aware that if Washington is able to sever the alliance between Russia and China, the first action of a Russia’s hypothetic pro-US government would be putting an energy garrote on China’s neck. Wall Street needs to colonize Russia first in order to subsequently colonize China. China’s leaders understand this very well. Incidentally, the same fate awaits Europe, which is yet another geopolitical competitor of the US. However, unlike Beijing, Europe’s leaders have not yet figured this out. It is important to keep in mind that the dollar’s attacks on gold end always end the same way – in a painful knockout for the dollar. There have been no exceptions to this rule throughout monetary history. Nor will there be this time. Hence the well-known market rule: “Any maximum of the gold price is not the last one.” It would be naive to believe that this golden rule is unknown to that grandmaster of patience, Vladimir Putin, and to Xi Jinping. By systematically increasing their gold reserves, Russia and China are relentlessly moving forward to strip the US dollar of its status as a global reserve currency. America’s standard military solution won’t work in this situation. Russia is not Iraq, Libya, or Yugoslavia. Were the US to launch direct aggression against a country like Russia, that would be their last move ever. Therefore, the White House is trying to use radical militants from Muslim and European countries as cannon fodder. There was a time when that approach was more effective. In the mid-twentieth century, Wall Street & London’s City managed to drag Europe into a war against the Soviet Union using their protégé Hitler, whom they had literally brought to power in Germany. Today Ukraine and Syria are the theaters for America’s hot war against Russia, and the European Union is the theater for America’s economic war against Russia (it is noteworthy that while European entrepreneurs are suffering under the sanctions imposed on Russia, their American competitors are busy signing lucrative new deals) with Moscow. Recently, European countries have begun to realize that Washington is simply conning them. After all, any product is, first and foremost, nothing but energy manifested in the form of a commodity. Taking its cue from America’s geopolitical ambitions, Europe is single-handedly reducing its own level of competitiveness. If we peel away the lofty slogans and declarations about “values” and just consider the dry economics of the matter, everything becomes clear: if the EU is cut off from its supply of cheap Russian energy, in addition to being cut off from the massive Russian market for its goods, Europe will not be able to survive in its present form. Wall Street and London’s City, as before, do not know, what Putin has in mind. But everyone is quite certain that Putin is up to something, and whatever that is will surprise everyone and advance the interests of Russia and its allies. It would probably have to be very different than an old gold standard,” Kenneth Hoffman, the Princeton-based head of global metals and mining research at Bloomberg Intelligence… “It wouldn’t be a traditional system where you walk into a bank and you walk out with an ounce of gold. It would have to be something new and different. Predictions by leading Western media outlets about the imminent emergence of a Russian-Chinese alliance to revive the gold standard are heard often enough that they now seem like signals or even calls for such a step, addressed to Moscow and Beijing. Back in the 18th century, the philosopher and writer Voltaire stated: “Paper money eventually returns to its intrinsic value – zero,” and he was absolutely right. There have been many different paper currencies throughout the history of mankind. But all of them, in one way or another, eventually reverted to zero and vanished. Those who lived during the reigns of such historical figures as Alexander the Great, Napoleon, Hitler, and Stalin honestly believed that the currency existing at that time would remain in circulation forever. But not one of those currencies still exists. And all that today’s dollar and ruble have in common with their previous incarnations from 100 years ago is the fact that their names are unchanged. The modern dollar and ruble are entirely different currencies, with different purchasing power, and a different appearance. Some currencies die off suddenly, some revert to zero through gradual depreciation, but somehow or other they are all worth nothing in the end. Obviously, the enfeebled US dollar that has lost 98% of its purchasing power in the last 40 years (as just another unsecured pseudo-currency) is already on the brink of its natural devolution to zero. This argument is increasingly used by advocates of a return to the gold standard. However, they forget that all gold currencies previously in circulation eventually died just as surely as the paper currencies. Why did this happen, since the gold currencies were secured by the gold they physically contained? Because any gold currency is, first and foremost, a currency with a designated value, not money based on the weight of the gold contained in those coins! Gold currencies had a fiat value represented by the denomination embossed on them, which imposed a legal duty on all market players. This duty required that they use all gold coins exclusively as currency, with a face value specified and assigned by law. But eventually an inevitable inconsistency emerged between the market value of the gold contained in the coin in accordance with its weight vs. the fiat value of the denomination that was embossed on the gold coin itself. 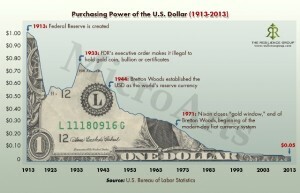 This inconsistency has spelled the end for every single form of gold currency throughout humanity’s monetary history. There are no exceptions to this rule, which is well known on Wall Street. It is critically important for that crowd that Russia and China be goaded into minting yet another doomed gold currency. As soon as Russia and (or) China issues such a gold currency, it will be immediately attacked by Soros and other Wall Street pocket speculators like him. Whatever the face value, in rubles or yuan, that is embossed on the gold currency of Russia or China, after a while that value will begin to diverge from the value of the gold within the coin. It will become profitable for speculators to cyclically exchange paper currency for gold currency, which will deplete the country’s gold reserves and consequently lead to default. This article was posted on Friday, November 13th, 2015 at 3:00pm and is filed under BRICS, China, Economy/Economics, Europe, Russia, Sanctions.